One thing that I do not understand about the French is that they do not have a hook for the shower head (and also no tray for the soap). Combine this inconvenience with old taps that are extremely difficult to adjust, and the result is that you start your day with an annoying fight with your shower. But it also ensures that you arrive perfectly awake at your first domain visit. Which was good, because both visits were highly interesting this day. And fully English spoken, so it was easier to talk about all kinds of nerdy wine details. Both visits are about guys from abroad coming to Burgundy to make an adventurous dream come true. Both in their own way. Mischief and Mayhem is the story of two friends starting a winery. One is Michael Ragg, who runs the domain in Aloxe-Corton with his wife Fiona, the other is Michael Twelftree, who flies over from Australia a few times per year, to be present at the key moments in the winemaking process. He himself runs Two Hands Wines, a Barossa Valley winery. In Ragg's previous life he worked for Berry Bros. & Rudd in the UK. At Mischief and Mayhem they do not grow their own vines. They buy grapes from selected vineyards. The selection process is strict, and is a pivotal first step towards making great wines. Working like this means that one can offer a wide (and also changing) variety of wines within a relatively short time. The alternative, acquiring your own (high quality) vineyards in Burgundy is extremely difficult, as we will see in the story about David Clark. Michael Ragg tells about his wines with infectious enthusiasm. He's excited about everything that has been achieved in a few years time. And he should be: the wines are impressive, and absolutely joyful. Bill Nanson from Burgundy Report summarizes the style as follows: "Clean and aromatic with a lovely core of acidity". The wines go from slender youthful to rich with a little cream in the texture, but they all share an certain - attractive - clarity. Ragg talked about "an acidic stream that runs through the middle" of the wine, from start to finish. Say the spine around which the wine revolves. Vital stuff it is. These are my favourites: the Chablis, the Meursault and the Pommard 1er cru, all 2005. Besides making great wine Mischief and Mayhem intend to "demystify Burgundy", as they put it themselves. Burgundy is a complex region, and the wines from Mischief and Mayhem all have friendly descriptive labels. Just as passionate, but in a totally different way, is David Clark. This young winemaker left his technical job for the Williams Formula 1 team to make wine in Burgundy. Problem one: French. David spent a year in France learning the language, after which he started attending the Dijon wine university. With some luck he then found a house with a cellar in Morey-Saint-Denis, and off he went. 2004 was his first vintage. His best piece is a four rows wide strip of Morey-Saint-Denis, he owns a lovely slope of Côtes de Nuits Villages, and he owns pieces of Bourgogne and Bourgogne Grand Ordinaire. David is working the land all by himself, makes the wine all by himself, is making a living all by himself. No family there in France. He comes across as a very friendly, even somewhat shy, young man. But he must have an enormous drive, an enormous power. And he's not 'just making wines'. David is in an ongoing search for the ultimate purity. Experimenting for example with leaving out sulphites. Which is difficult, and may appear to be too difficult. And adding an oak-flavour to wine he defines as "cheating". We tasted the 2006's from the vat (David was almost about to bottle these wines), and the results are beautiful. Very ... pure ... fruit. Available in very ... small ... quantities. Most sold in the UK (Ragg's Berry Bros. & Rudd! ), and in the US. And I feel very lucky to have bottles no. 2 and 3 from the 2006 vintage. Bottle no. 1 was issued to the Guide Hachette. David was so kind to drive us around and show us his cherished vineyards. A truly interesting visit, and I will definitely follow David the coming years. 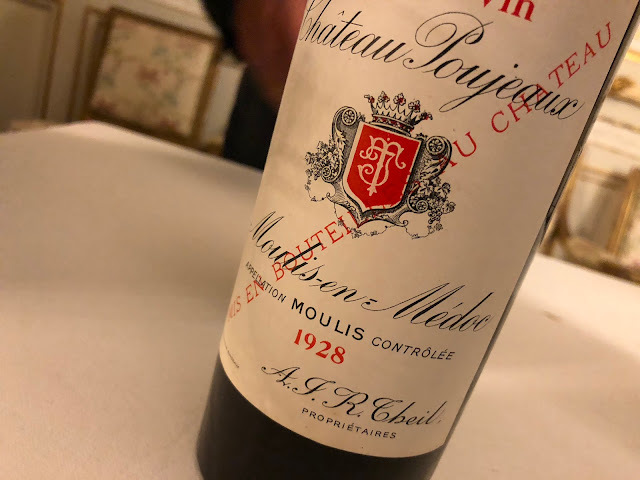 Before we left Morey-Saint-Denis we bought some wines at the Caveau des Vignerons (some Arlaud, and two Clos des Monts Luisants blanc 2005 (Ponsot) that I will drink with my son in 20 years, he was born in 2005; a 1988 that I recently tasted was quite spectacular). And we concluded the day in Le Comptoir des Tontons with a very mediocre Chassagne-Montrachet 1er cru (Clos Saint-Jean 2001) from Alex Gambal. We shouldn't have been so strict about this Anglo-Saxon theme... for we'd almost opted for a Domaine Leflaive... Will do next time.